I have so far tried their rice substitute and am super impressed. Easy to prepare and very delicious. Can 100% recommend. And eat super healthy at the same time! Receive a monthly selection of 18 Shileo meals (9 portions of Roooaaar Rice & 9 portions of Roooaaar Pasta). Subscribe to Shileo and get up to 15% off the single order price, plus free shipping. Cancel any time! €44.95 per month, shipping & VAT included! We'll charge you & ship the items at the beginning of each month. YES we do offer customized plans! 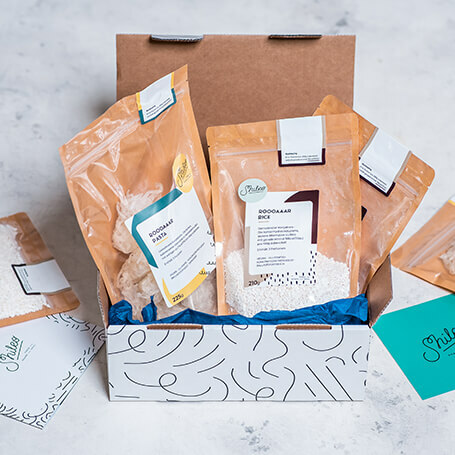 You feel like you'd enjoy a monthly subscription but you want to change it a bit? Contact us at hello@shileo.com and we can set up something just for you. Sign up now, and receive a box at the beginning of each month!